Okay, the past couple of weeks have been beyond COLD for us Manitobans! What better way to warm up our hands and bellies than with an awesome bowl of chilli?! When I was looking for recipes ideas for a potluck I attended recently, I knew I wanted to make something warm and comforting. 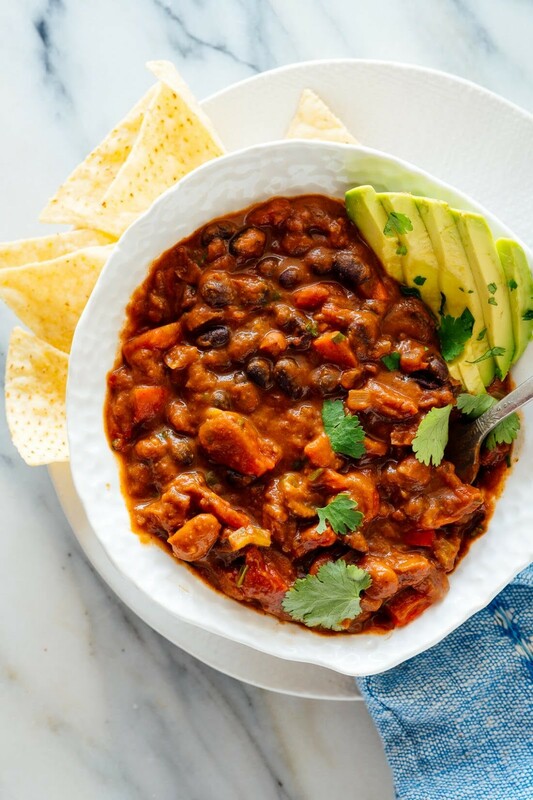 That is when I came upon this delicious Homemade Vegetarian Chili recipe by blogger Cookies and Kate. This chili is full of fibre-rich beans, which are being widely promoted on the revised Canadian food guide. The new Canada’s Food Guide was released Tuesday, January 22nd, and for those who have missed it so far, I will give you a little update. This food guide encourages Canadians to emphasize vegetables, fruits, whole grains, and to choose plant-based proteins more often. Plant-based proteins include beans, lentils, nuts, seeds, and soy foods such as tofu. You can read more on the new Canada’s Food Guide here. The new food guide also encourages us to cook more of our meals at home, to eat mindfully, and to enjoy meals with others. So, whether you are doing some batch cooking for the week, cooking for your family or getting ready for a potluck, give this Homemade Vegetarian Chili a try! The smoky, complex flavor of this simple vegetarian chili comes from basic pantry ingredients, vegetables and spices! It makes great leftovers, too. Recipe yields 4 large or 6 moderate servings of chili. In a large Dutch oven or heavy-bottomed pot over medium heat, warm the olive oil until shimmering. Add the chopped onion, bell pepper, carrot, celery and ¼ teaspoon of the salt. Stir to combine and cook, stirring occasionally, until the vegetables are tender and the onion is translucent, about 7 to 10 minutes. Blog and photo by Angela Tucker. Angela Tucker is a plant-based Registered Dietitian from rural Manitoba. Angela first became vegan for compassionate reasons and soon realized other ways a vegan lifestyle and a plant-based diet positively impact the planet and our health. Since then she has become passionate about health, wellness and sustainability. Angela sees clients virtually for nutrition counselling sessions through Skype and FaceTime. If you are interested in working with her or if you want to learn more about her philosophy on food, visit her website PrairieSprout. You can also find her on Facebook and Instagram.